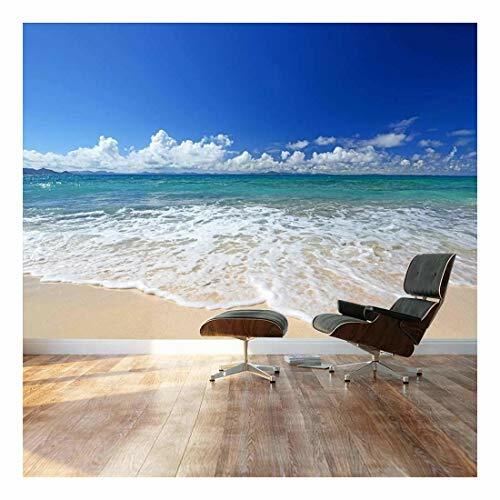 wall26 Large Wall Mural - Gorgeous Beach and Clear Sea in Summertime | Self-adhesive Vinyl Wallpaper/Removable Modern Decorating Wall Art - 66"x96"
The wall mural is cut into 4 pieces for easy installation, each in 66"x24",total size is 66"x96"
All Wall26® wall murals have a durable water resistant matte lamination. Very High Quality Self-adhesive Vinyl with 7+ year exterior life! Very easy to apply, remove or reposition - Just PEEL & STICK! We followed the installation instructions exactly as they were written. When installing the first panel, I expected the bottom section that includes instructions and panel number to be scored and peel off when I reached the bottom. That was not the case. I went back to trim the bottom of the first panel and you can see that it pulled the paint off my wall. Cut the bottom off before installing. The overlap on these panels is one inch. Installation was easy. I would have given it a five star rating until it took chunks and paint off of my wall. Arrived on time, good quality. The mural is beautiful. I absolutely love it. It got easier to install as time went on, but overall wasn't too bad. I installed it alone and it took about two hours. I did stick and unpeel it a couple of times and it took off pieces of the wall. One tip that I didn't realize is that each section should overlap about an inch or so to match up exactly.